Sadly, I was not expecting Suntory to revamp its flagship The Premium Malt’s beer, and never did a review of the original version. I did drink it on occasion, but was never a true fan of The Premium Malt’s, finding it to have a very sharp bitterness that was not offset by any pleasant flavors. In short, I could only drink a can or two before having to switch to something else. In March 2012, Suntory released a new version of The Premium Malt’s line, which can be found on the store shelves now. 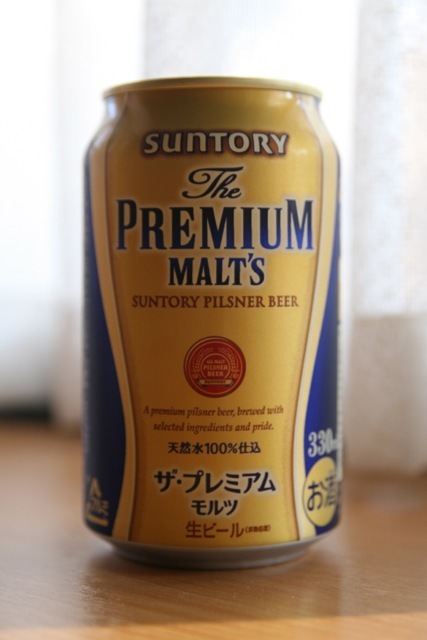 Perhaps the biggest change is the new label of “Pilsner Beer.” For this new version of The Premium Malt’s, Suntory has chosen to use European Aroma Hops (Saaz) from Czech and Germany and Diamond Malt grown in Czech and surrounding areas. Let’s see if Suntory’s New The Premium Malt’s can find a permanent spot in my refrigerator. In the glass, it’s the usual pale straw, nothing different there. The nose shows off the malt and hops. I took a big gulp, and to my surprise they’ve really toned down the unpleasant bitterness. It still has the bitterness you come to appreciate in a Japanese lager, but in a much more palatable level compared to the former The Premium Malt’s. The first gulp had some tanginess, and a nice full flavor that lingers well after downing that first gulp; those aroma hops must also bring in a little citrus flavor to the table. A pleasant effervescence also lingered on the tongue. After the daily dose of new genre offerings, it’s a great feeling to gulp down a truly Japanese beer. 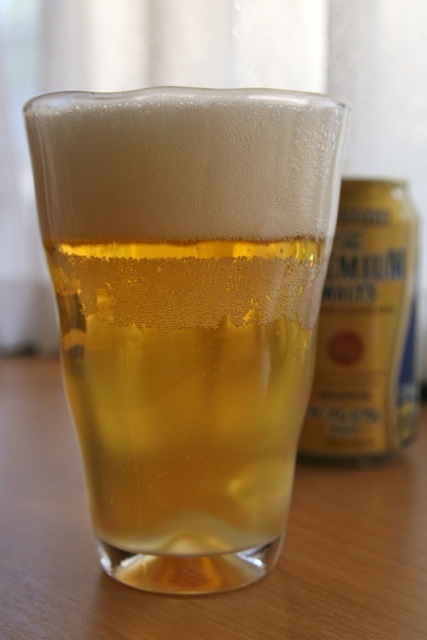 I must say that Suntory The Premium Malt’s has improved on its formula, and has created a premium beer that I would be happy to stock in my refrigerator given the means were available. Alas, I cannot afford such luxuries, but will definitely look forward to seeing the Suntory The Premium Malt’s label on restaurant menus in the future. This entry was posted in Japanese Beer and tagged all malt beer, Japanese beer, premium beer, Suntory. Bookmark the permalink. The price has remained the same I think, but I realized the cans are only 330mL. I really miss those missing 20 milliliters. I live in Taiwan and recently holidayed in Japan. I loved the beer but was surprised at the selection , indeed it was good but basically had no foreign competition. I was also surprised at the void between good beers and bad. We don’t have the malt tax that Japan incurs. The knock on effect is well none existent. Meaning the lower malt or fake beers hit our shores at the same price as the regular and high malt beers. You can see the Tanrei-nama (Kirin) and the Kirin green label for the same price as the Premium Malt’s. It is a shame that it is pricey in Japan. Lastly I don’t know why the Premium Malt’s has an apostrophe after the t. Good blog , keep it up. Yes, the grocery and convenience stores carry mostly Japanese brands. You’ll usually find Budweiser, Heineken, and Corona on the store shelves, but I don’t see anyone buying them. I have no idea about the apostrophe, just strange naming. Thanks for the comment, I’ll try and get some of the new beer reviews up. Good stuff. I am interested to compare beer notes. Have you tried Taiwan beer? Hmm… I don’t think I’ve ever tried a Taiwanese beer before. I’d have to look around, but I don’t think I’ve even seen one on the store shelves. Not surprising given most larger brands aren’t in Japan. I will also endeavor to drink more of the obscure Japanese brands. We do get a lot over here. Indeed we get the seasonal ones in abundance. We have all the xmas and even some of the Autumn ones ( that haven’t sold) . Ironic as I never saw any seasonal ones in Tokyo despite looking everywhere. I liked the Winters tale but find some of the special ones taste a lot like the regular ones. The Autumn ones last year did taste a lot stronger ( sometimes 6%+) and had a more fruity edge to them. I seem to have divided my drinking into two categories as of late. Eating and drinking. The stronger beers I drink as a stand alone. The light ones with food. Yes, the Autumn beers have a higher ABV and the winter brews have more of a bitterness to them generally. I usually drink the beers I blog without food, and stick to my budget friendly Mugi to Hop on a daily basis. While most Japanese beers taste quite similar, it’s fun to find the ones that stand out. Wow, I’m impressed. I had one of these a few years ago and didn’t think much of it. Decided to try it again last week, on a whim. Definitely wouldn’t mind drinking one of these every day! I’m a novice so I couldn’t really tell where those unique flavors were coming from. It must be those Czech hops and German malts. I keep hearing Czech Pilsners are great. Wouldn’t surprise me then. Just caught a sale this week and got a can for 208. Couldn’t pass that up. The original version of The Premium Malt’s had a crazy bitterness to it. When they reformulated the recipe, they really toned it down and made The Premium Malt’s more well rounded, and very tasty. I’d love to drink it more often, but it’s a bit pricey. I never been a drinker, we have one very popular in the Philippines which is San Miguel Beer, too bitter to finish a bottle for me and it has to be very cold. I have to order soda every time there is a get together. But last Friday night – May 29, a very kind person brought me to a dinner in harbor bay. I initially ordered a white wine but immediately changed it to a beer. “SUNTORY WAS REALLY GOOD, NO BITTER TASTE and I WAS ABLE TO FINISH THE GLASS JUST LIKE DRINKING SODA.” IT’S TEMP DOESNT HAVE TO STAY AS AN ICE COLD ONE AS WELL. Fatima, I’m happy you’ve been able to find a Japanese beer you can enjoy. The Premium Malt’s is a great one! It’s been a while since I’ve had a San Miguel, so I’ll have to try it again soon to compare. Thanks for the comment.